If an individual broke a bone in an auto accident, commercial vehicle accident or a pedestrian knockdown, the medical complications may be more complex than you might expect. An accident involving a motorized vehicle often results in multiple fractures. It is not uncommon to see pelvic fractures, sternum fractures, skull fractures, collarbone fractures or injuries to the spinal cord. The complex nature of these fractures and the possibility that a single arm or leg may experience multiple fractures and crush injuries may require surgery to set the bone. It is also possible reconstructive surgery will be required. Depending on the extent of the injuries suffered in an auto accident, physical recovery could take a considerable amount of time, resulting in large medical expenses and loss of income. A greenstick fracture occurs when the bone both bends and cracks, instead of a complete break into two or more separate pieces. This bone break is most commonly seen in the softer and more flexible bones of children. A stress fracture is commonly noted as a tiny crack in a bone. The fractures are typically caused by the repetitive application of force, often by overuse. Stress fractures can also arise from normal use of bone that has been weakened by a condition or from a crushing accident. This fracture occurs when the force of the accident causes a broken bone to break out of the skin. There is a significantly increased risk of wound infection when a bone breaks through the skin. Complications are expected in these cases. 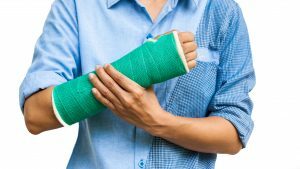 If you have suffered a broken bone in an automobile accident, in Florida, we might be able to help you recover compensation for medical expenses and losses. Feel free to use our contact form on our website to schedule an appointment to discuss claim with a representative from William McBride Law Group.